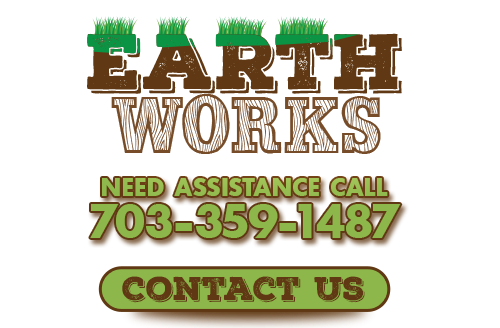 When you are looking for the absolute best in the Fairfax area when it comes to your landscaping and lawn care needs, the only name in quality that you need to know is Earthworks. Our team of Fairfax landscaping and lawn care service professionals have dedicated themselves to helping local homeowners maintain and transform their landscapes for over twenty years now, and we plan to continue doing so for many years to come. Our team of professionals here at Earthworks make it our top priority to ensure that each and every one of our valued customers has access to the high quality landscaping and lawn care services they need to keep their homes looking their best at all times. From maintaining your current landscaping, to completely new landscape design and installation work, our team of experienced pros will work tirelessly to make sure the job gets done, and gets done exactly like you want it to. Our team of expert landscapers have the skill, training, and experience necessary to tackle any landscaping job, no matter how complex it might be, and provide you with the exceptional quality results you need to take your home's design to the next level. Here at Earthworks, our team of professionals take a great amount of pride in the fact that we are able to consistently deliver the highest quality landscaping and lawn care services in the area to all of our valued customers again and again. When you make the call to our team of pros here at Earthworks, you can always count on timely and dependable service that never sacrifices quality for the sake of speed. Our team of experts will work with you directly to determine exactly what it is that you're looking for from your landscaping project, and come up with a detailed plan to turn those desires into a reality. We guarantee that by the time you see the finished results of your project, you will understand why we are known as the premier landscape and lawn care service in the Fairfax area. Give us a call today if you have any questions about our full line of professional landscaping and lawn care services, or if you would like to schedule an appointment for consultation with one of our skill specialists. Our team of Fairfax landscaping experts are always standing by and would be more than happy to assist you in any way we can. Whether you are looking to install a fresh landscape for your new home, or you are just looking to replace your existing landscape with something a little newer and more elegant looking, our team of professionals here at Earthworks are ready to help you make the most of your project. Our team of landscaping experts will work with you directly to figure out exactly what it is that you want from your new landscape, and form a detailed plan to turn it into a reality. We will keep you involved throughout every step of the design and installation process to make sure that your final product stays as close to your initial plan as possible. If you are ready to have the landscape of your dreams, the only name in quality that you need to know is Earthworks. 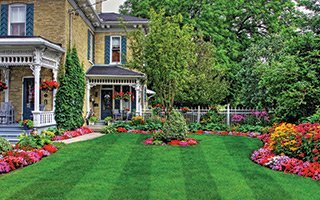 Making sure that your home's lawn has the kind of care it needs to continue looking its best at all times is a major responsibility as a homeowner, and a good deal of work as well. If you are like most homeowners, your time is extremely precious to you, and it's not always easy to find the spare time to give your lawn the kind of care it needs to stay at its best. That's where our team of professionals here at Earthworks come into the picture. Our team of experienced lawn care and maintenance specialists can give your lawn the kind of quality care it needs to stay healthy and beautiful, and give you that extra free time that you can go on and spend with your family instead of pushing a lawnmower around. 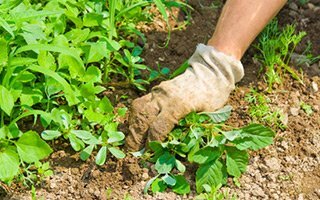 Weeds are a serious issue for many homeowners all across the country. There are few things that can choke the life out of a healthy lawn quite like an infestation of weeds, leaving you with a lawn that just never seems to look good, no matter how much work you put into it. Our team of professionals here at Earthworks have a lot of experience in dealing with these troublesome aspects of a lawn, and we know what it takes to get rid of them, and keep them at bay in the future. 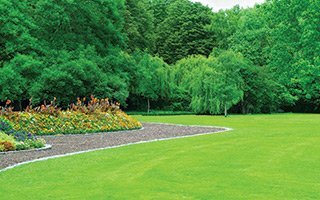 If your lawn is looking overrun, give our team of experts a call today and let us help you restore the beauty and health of your home's lawn. There are few projects that can add value to your home and beauty to your landscape like a high quality hardscaping project. Hardscaping covers a wide variety of different projects, including the design and installation of new stone patios, retaining walls, fire pits, and even entire outdoor living spaces. Hardscaping can provide you with a nice decorative touch for your home's exterior, or it can provide you with that wonderful functional outdoor space that you've always wanted for your social gatherings. If you are looking for a surefire way to add value, function, and overall beauty to your home, you can never go wrong with a tasteful hardscaping project carried out by a team of experienced professionals. Here at Earthworks, our team of experienced landscaping professionals are fully dedicated to making sure that your next project provides you with the most in terms of both value and enjoyment for your home. We believe that your outdoor living spaces should be a natural extension of your home into the outdoor areas of your property, and with our help, you can extend every bit of your home's interior comfort into your outdoor spaces. 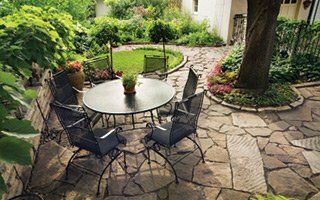 From a lush, beautiful landscape for you and your family to enjoy, to a new natural stone patio that is sure to wow everyone at your next backyard cookout, we can help you do it all. Our team of professionals are ready to help through the entire project, from the initial design, all the way through the final cleanup. All you have to do is give us a call. If you are looking for a landscape and lawn care professional in the Fairfax area then please call 703-359-1487 or complete our online request form. My neighbor recommended Mark from Earthworks. After seeing their lawn, I knew I needed his help! Mark was very down to earth and we were able to put together a lawn care plan to help my landscaping needs.